JOIN US #OFFSITE AND EXPERIENCE A BEVY OF FREE PROGRAMS + EVENTS THAT EXPLORE THE BLURRED BOUNDARIES BETWEEN WORK + LIFE. To RSVP for any of the free events below, click the RSVP button above. Join us throughout the day to get your work done, take a meeting + camp out at LMHQ. We're kicking off the first day of #OFFSITE with a free meditation sesh hosted by The Path NYC, who teaches ancient meditation techniques in a modern way, and will be led by instructor Ally Bogard. Get your buzz on with coffee from Blue Spoon Coffee Company and chia bars by Health Warrior. Free lunch and lessons learned from thought leaders in Lower Manhattan. It's time for lunch! Join us for this healthy discussion with PivotDesk, SumAll, and Live in the Grey about work/life balance and building community. David Mandell, PivotDesk Founder + CEO, Dane Atkinson, SumAll CEO, and Jessica Ogilvie, Senior Advisor at Live in the Grey talk transparently about entrepreneurship and provide real, actionable advice that can help a startup entrepreneur make it. This Innovation Lunch will cut through the noise and help entrepreneurs focus on what truly matters when they are in the trenches of starting a business. Get your mind + belly hungry - lunch is provided by Smorgasburg's Lonestar Empire's slow-smoked Texas-style brisket. The title "Chief Innovation Officer" or "Director of Innovation" is relatively new to the corporate landscape. What exactly do these innovation executives do? How do they support innovation in their organizations through their workplace environment - at the office, and beyond? This panel will discuss the trajectory of these organizations and how they roadmap their physical environment to lead to innovation business results and happy employees. Join some of NYC’s visionary innovation leaders representing the various industry sectors of Lower Manhattan, from finance to government to media and technology discussing their insights and strategies. You earned it! Join us for a fun, fresh, celebratory dinner delivered by Maple, the new food startup backed by David Chang. Arrive in time to hear remarks by LMHQ parent organization Alliance for Downtown NY President Jessica Lappin to innagurate our space! Live set by Taylor McFerrin, cool tunes provided by DJ Vikas and delicious, summery cocktails provided by Art In The Age Craft Spirits + Swill. Beer on tap by Lost Tribes. Start the 2nd day of our epic fest hearing from some of the boldest founders out there. June is Pride Month, and we’re celebrating with 2 LGBTQ founders who have created amazing products. Featuring: Andy Saldaña of NY Tech Meetup, in conversation with Jason Marchant, Founding Partner & Chief Product Officer of Scruff, and Maureen Erokwu, Founder of Vosmap and Ambassador of Lesbians Who Tech. What could possibly be better than a plate full of summer BBQ provided by Lonestar Empire while hearing leaders in the NYC's startup community discuss company culture - how to develop it, manage it, and scale it, and everything in between. Moderated by Kelcey Gosserand, Associate Director at the Startup Institute, with panelists Nick Christman, Marketing Director at Namely, Alex Abelin, CEO & Co-Founder at Liquid Talent, Katie Radford, Head of Fun at DoSomething.org, and Rob Dandorph, Sales Operations Manager at Stack Exchange. Broadband has become an essential tool to drive communication, economic opportunity and innovation. Hear Control Group discuss the potential opportunities of their project, LinkNYC, in a townhall format with ample time for audience Q+A. Leaders in tech + civic service will give lightning talks to explore how LinkNYC and broadband may influence the way people live and work in the public realm, ensure equity for all communities, and inform the return on investment for new and upgraded civic infrastructure, and how technology and data can improve quality of life while helping us become a more competitive and resilient city. The creative collective behind culture mag Mass Appeal are throwing this evening's bash, and you definitely don't want to miss it. Watch a clip from their soon-to-be released documentary on the history of hip hop fashion, Fresh Dressed, and participate in a discussion and guided workshop with director, author and Mass Appeal Creative Director Sacha Jenkins and renowned artist Greg Lamarche about graffiti's influence on graphic design, and the notion of the "tag" as an exercise in personal branding. Party beats brought to you by DJ Parler. Brother's Soul Bean Pies brings their tasty creations to Lower Manhattan for replenishment after a nonstop day of action at LMHQ. Delicious, summery cocktails provided by Art In The Age Craft Spirits + Swill. Beer on tap by Lost Tribes. It's Friday morning, so naturally we want to take our time getting to the office! Grab breakfast with us, meet some new folks working in creative tech, check out LMHQ, Lower Manhattan's newest addition to the neighborhood, meet our awesome neighbor, Dev Bootcamp, and get a jump start on your Friday! Tarek Pertew, Co-Founder and CCO at Uncubed, hosts today's lunch and discussion with Ali Nicolas, Co-Founder and Director of Inside Startups. Together they'll explore employer branding strategies to attract and retain employees. Smorgasburg's Red Hook Lobster Pound will be providing a lobster roll lunch, straight outta Maine. Final Countdown: Party Down with LMHQ! The final countdown. We officially open our doors to the public July 1st, but invite you inside for the final party of our kickoff fest, #OFFSITE. DJ Artie Kenney will be on the one's and two's, artist Olek will be bombing LMHQ with crocheted yarn sculptures and creatures, and WeWork will be there, hooking you up with snacks + grab cookies by Ovenly. Delicious, summery cocktails provided by Art In The Age Craft Spirits + Swill. Beer on tap by Lost Tribes. Let's do this, LM. The Path teaches ancient meditation techniques in a modern way. We teach four types of meditation: energizing, mindfulness, mantra and intention-setting. By introducing you to each, we give you the tools to create a custom meditation practice, designed just for you. David Mandell is Co-founder and CEO of PivotDesk, a TechStars Boulder 2012 company that helps find space for growing businesses. Having served as a TechStars mentor since the start, he has entrepreneurial experience that runs the spectrum from small, start-up organizations to large multinational corporations. David is also the managing partner at VentureVoodoo partners, a consulting firm specializing in brand management for startup organizations. Dane Atkinson started his first company, SenseNet Inc., at the age of 18. The company grew explosively through servicing Fortune 500 companies (WPP, Pfizer, Lucent) to hundreds of employees on three continents. Since then, he's had an extremely successful career as a technology executive and has founded, bought, and sold over a dozen companies. In addition to his position as CEO, Dane also acts as advisor and board member to several leading technology companies. Jessica Jewell Ogilvie is an experienced entrepreneur and currently serves as the Chief Marketing Officer of Validately, a platform that simplifies user research. She is also a senior advisor to Live in the Grey. Jessica's entrepreneurial journey began in 2007 when she founded AdBuyer.com, an online media buying platform. AdBuyer was acquired by Mediaocean in 2011. Prior to AdBuyer, Jessica spent several years at Morgan Stanley and McKinsey & Company. She holds a B.A. from Yale University and an M.B.A. from Harvard Business School. Amanda Ramos is a Director of Innovation with Gensler’s consultancy practice with an expertise in workplace design strategy. Her highly collaborative and creative process stems from her education as an architect, and her experience working with interdisciplinary teams of interior, industrial and graphic designers at Gensler, Bruce Mau Design and Ralph Appelbaum Associates. She has taken on many roles from visioning to design thinking; from ideating to storytelling; from researching to innovating. Ariel Kennan draws upon her experience in multidisciplinary design and technology to lead research, concept development, and design, collaborating closely with design teams, vendors, and partners. She has created digital strategy and policy, mobile applications, websites, and media installations with a wide variety of cultural, corporate, and government partners. Head of Talent Management, IEX Group, Inc.
Brannon heads up talent management at IEX, focusing on scaling culture, employee engagement, and people operations. Coming from a long line of NYC tech startups (previously at Aviary, ZocDoc, and TheLadders), she specializes in balancing organizational health and company culture against operational efficiency in rapidly growing startup environments. Follow her on twitter at @brannontate. Brooklyn-based producer, composer, pianist, DJ and live musician Taylor McFerrin is set to release his first full length LP, Early Riser, in June 2014 on Flying Lotus’ Brainfeeder record label. Taylor’s musical style is equally influenced by the legends of 60s/70s Soul, the kings of the Modern Beat Generation, Golden Era hip hop, free form jazz and electronic music. By playing all of the instruments on his productions, while also relying heavily on sampling and chopping up his live takes, he has found a sound that seamlessly bridges myriad musical worlds and draws the listener into a constantly shifting audio soundscape. One of the most sought after open-format DJs in New York and abroad, Vikas is known for his ability to blend every genre and decade of music. When he's not behind the booth, Vikas is developing Rippl, a music app bringing exclusive mixes for every mood curated by the best DJs worldwide. Maple is a new food concept that combines New York’s best chefs and culinary talent with high-quality ingredients and rotating daily menus, all delivered straight to your door with the tap of a button. It's nice to meet you, we're excited to cook you something awesome. Event planning, fundraising, food and drink loving, recipe making, Tex-Mex guy in NYC that loves great conversation over coffee and baked things. NY Tech Meetup (NYTM) is a 44,000 member non-profit organization running the largest Meetup group in the world and supports the growing NY technology community. With over 50 million messages exchanged every week, SCRUFF is the dating and social networking app of choice for a community of more than 5 million gay, bi, and curious guys worldwide. SCRUFF is the only gay app on every major platform (iOS, Android and Windows Phone). The SCRUFF Facebook page has more than 350,000 fans, making it the largest gay social media presence worldwide. Helping companies attract clients and gain visibility on Google Maps, Search, Street View and + Local. Vosmap is an award winning company tasked with expanding Google Business View. With the newly launched Street View expansion customers can walk around, explore, and interact with businesses like never before all right from their Smart phones, PC, and Tablets. Kelcey is the Associate Director for Startup Institute New York where she is responsible for partnerships and strategy. Startup Institute is an immersive educational experience for the innovative economy. Kelcey is an avid traveler, Paleo-foodie, and a self-professed health nut. Nick is Marketing Director at Namely. Prior to Namely, Nick worked in sales, marketing, and business development roles at three startups, and as a consultant at McKinsey. He's a Dartmouth College and Harvard Business School grad. Outside work, Nick plays lots of men's league soccer, with more intensity than speed or skill. Alex Abelin is the Co-Founder and CEO of LiquidTalent, a new generation job platform modernizing the way professionals discover, connect and work together. The LiquidTalent platform connects exceptional professionals in the Technology and Creative fields with local businesses. We believe the Future of Work will be more mobile, independent, and lifestyle driven. Prior to starting LiquidTalent, Alex served as Google's Public Affairs Manager from 2005 to 2013. Oversees internal operations at DoSomething.org. Responsible for making sure all things are running smoothly, efficiently, and FUN-ly. From keeping supplies stocked to hiring new employees, I touch a little bit of everything that goes on inside our fast-paced office. Katie supports office culture: Planning/running fun and useful events for employees like Secret Santa, Fail Fest, Brown bag lunches, Staff Retreat, applying for Non-Profit awards, and spearheading the weekly staff meeting. Rob is the Sales Operations Manager for roughly 100 sales reps at Stack Exchange, a top 40 website. He also works on legal matters and internal product management. Rob has a JD/MBA from Boston College and has seen various cultures at play while at Sony Music, Pearson, Federal Courts, VC firms, and startups. Jeff helps organizations working at urban scale deploy technology to improve customer experience and operational outcomes. He is especially interested in public-private partnership, the role of the arts and culture in placemaking, and new approaches to service delivery--particularly transportation and government. Anthony M. Townsend is an American researcher. Townsend specializes in research on the implications of technology on cities and public institutions. Currently Townsend is the director of research and Director of Technology at the Institute for the Future, a Palo Alto, California think tank established in 1968 to help companies plan for the long-term future. His interests span numerous topics including; mobility and urbanization, innovation systems and innovation strategy, science and technology parks and economic development, and sustainability and telework. Bonnie Tijerina is a Fellow at Data & Society Research Institute, a NYC-based think/do tank focused on social, cultural, and ethical issues arising from data-centric technological development. Bonnie works closely with libraries to support user privacy and empower the general citizenry to make informed decisions about their data. Government advisor and non-profit founder with more than 15 years of domestic and international experience in government innovation, civic engagement, political consulting, democracy-promotion, marketing and communications. Karen Wong is the Deputy Director of the New Museum in NYC where she cofounded the initiatives IDEAS CITY which explores the future of cities with the belief that art and culture are essential to our metropolises, and NEW INC, the first museum-led incubator for art, technology and design. She was the managing director of Adjaye Associates from 2000-2006 and supports emerging architects in her role as a board member of Storefront for Art and Architecture and + Pool. In the early 90’s she founded Hobbamock, a Boston-based design firm committed to non profits and social causes. Theodore Ullrich (1984) is the Founding Partner of Tomorrow Lab®, an internationally recognized product design and engineering studio based in New York City. Tomorrow Lab develops and manufactures smart hardware products for their clients, and was recognized on the cover of Entrepreneur Magazine in 2014 as Top Tech Innovators. Ted regularly speaks on the role of design studios as invention centers and the application of science and design to small entrepreneurial ventures to create new technology products that solve big problems. Inspired by the dynamism of his native New York City and its role as an incubator of the outlaw art of graffiti, Greg Lamarche's collages combine the city's relentless rhythm and graffiti's aggressive presence to express the power, elegance and rebelliousness of urban creativity. Using found materials and commercially printed papers from his vast collection of vintage printed matter, Lamarche abstracts graffiti's visual language, playing with a profusion of font styles, word fragments, multiple layers, bold colors, rhythmic repetition, multiple perspective and movement. Sacha Jenkins is an American television producer, filmmaker, writer, musician, artist, curator, and chronicler of hip-hop, graffiti, punk, and metal cultures. While still in his teens, Jenkins published Graphic Scenes & X-Plicit Language, one of the earliest ‘zines solely dedicated to “graffiti” art. In 1994, Jenkins co-founded ego trip magazine. In 2007, he created the competition reality program “ego trip's The (White) Rapper Show," which was carried by VH1. Currently, Jenkins is the creative director of Mass Appeal magazine. New York City based DJ Parler (par-lay) has rocked audiences and tastemakers across the U.S., South Africa, Germany, Italy, Brazil, Mexico and beyond. His eclectic style and ability to move a crowd allows party goers to experience a musical journey that ranges from Hip Hop, Funk, Soul, Breaks & Rare Grooves, Reggae, Electro, Rock, 80′s & 90′s, International Sounds and more. Highly sought-after, Parler has done events for Nike, Carmelo Anthony, Pitbull, Serena Williams, Spike Lee, Kobe Bryant, and Sony Music. Dev Bootcamp is an immersive 19-week computer programming program founded by Shereef Bishay, Jesse Farmer, and Dave Hoover in February 2012. It is designed to make graduates job-ready by the end of the program. Dev Bootcamp is headquartered in San Francisco, California, with additional locations in Chicago and New York City. Dev Bootcamp New York City is located in the center of Manhattan’s financial district, now about more than just banks. Tarek Pertew is Co-Founder & CCO at Uncubed: a company dedicated to connecting talented individuals to next generation companies through interactive conferences around the nation, cutting-edge skill classes, and daily content. Tarek is an advisor to the United Kingdom Trade & Investment (UKTI), Enstitute (the national apprenticeship program), and the University of Virginia. Tarek is also the creator of NYC Footy, an adult soccer league here in NYC, favored by many NYC startups. Ali Nicolas is Co-Founder and Director of Inside Startups, which connects talented people with hiring startups through networking events, a company directory, and a weekly newsletter featuring select jobs and events. Ali also currently works with the mobile app dev/design team at leading sports and entertainment company, WME | IMG. Previously the VP People at OMGPOP (creators of Draw Something), Ali helped grow the team, improve internal communications, and create a fun culture that enabled dreams to come true. Artie Kenney is the founder AKT Agency which was established to connect brands with consumers, influencers and tastemakers alike with clients already ranging from Go Daddy, JC Penney, and most recently Tribeca Film Festival. Artie's innate ability to discover the best and the brightest talent and emerging lifestyle trends before they explode has led him to consistently create cutting edge connections no matter what the project at hand requires. Artie is a music lover at heart and has a always had a passion for DJ-ing even at a very young age. interconnectedness of our body and psychological processes. + events that explore the blurred boundaries between work + life. DO MORE THAN JUST WORK — CONNECTING DOERS + THINKERS IN LOWER MANHATTAN. to do more than just work. LMHQ serves as an add-on to your office, a place to get away from your desk and take up some space. Lower Manhattan, the oldest neighborhood now with the newest ideas, is a rapidly growing ecosystem full of creative businesses with innovation at their core, all at a crossroads of industries. We’re a community of thinkers and doers. Meet us at LMHQ, and do more than just work. We sold out quicker than we expected! You can still hang out and attend our upcoming events — signup for this ticket to receive more information. From thought leadership discussions and innovation clinics, to unique social events, performances and arts + culture experiences, LMHQ is a premiere venue for the creative community to forge meaningful connections, and you're invited! 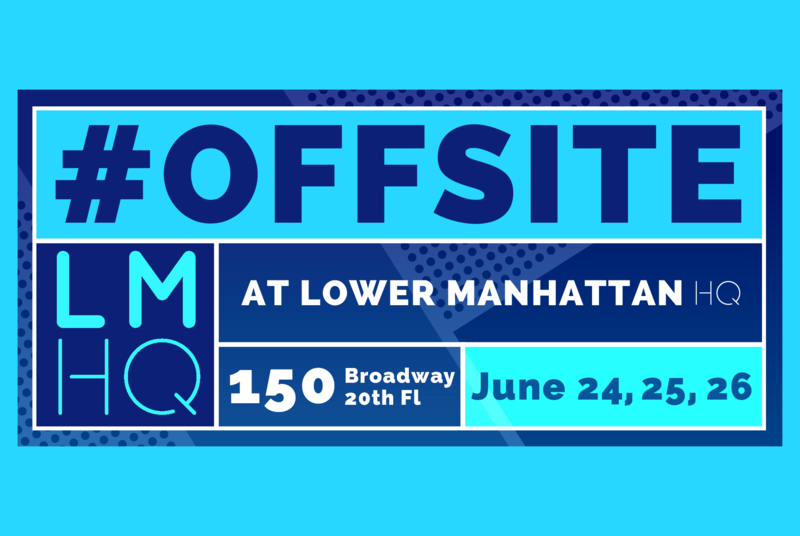 This ticket does not include admission to the #OFFSITE event. We're kicking off the first day of #OFFSITE with a free meditation sesh hosted by The Path NYC, who teaches ancient meditation techniques in a modern way, and will be led by instructor Ally Bogard. Get your buzz on with coffee from Blue Spoon Coffee Company and chia bars by Health Warrior. Free lunch and lessons learned from thought leaders in Lower Manhattan. It's time for lunch! Join us for this healthy discussion with PivotDesk, SumAll, and Live in the Grey about work/life balance and building community. David Mandell, PivotDesk Founder + CEO, Dane Atkinson, SumAll CEO, and Jessica Ogilvie, Senior Advisor at Live in the Grey talk transparently about entrepreneurship and provide real, actionable advice that can help a startup entrepreneur make it. This Innovation Lunch will cut through the noise and help entrepreneurs focus on what truly matters when they are in the trenches of starting a business. Get your mind + belly hungry - lunch is provided by Smorgasburg's Lonestar Empire's slow-smoked Texas-style brisket. Start the 2nd day of our epic fest hearing from some of the boldest founders out there. June is Pride Month, and we’re celebrating with 2 LGBTQ founders who have created amazing products. Featuring: Andy Saldaña of NY Tech Meetup, in conversation with Jason Marchant, Founding Partner & Chief Product Officer of Scruff, and Maureen Erokwu, Founder of Vosmap and Ambassador of Lesbians Who Tech. Get your buzz on with coffee from Blue Spoon Coffee Company and chia bars by Health Warrior. Free lunch and lessons learned from thought leaders in Lower Manhattan. What could possibly be better than a plate full of summer BBQ provided by Lonestar Empire while hearing leaders in the NYC's startup community discuss company culture - how to develop it, manage it, and scale it, and everything in between. Moderated by Kelcey Gosserand, Associate Director at the Startup Institute, with panelists Nick Christman, Marketing Director at Namely, Alex Abelin, CEO & Co-Founder at Liquid Talent, Katie Radford, Head of Fun at DoSomething.org, and Rob Dandorph, Sales Operations Manager at Stack Exchange. The creative collective behind culture mag Mass Appeal are throwing this evening's bash, and you definitely don't want to miss it. Watch a clip from their soon-to-be released documentary on the history of hip hop fashion, Fresh Dressed, and participate in a discussion and guided workshop with director, author and Mass Appeal Creative Director Sacha Jenkins and renowned artist Greg Lamarche about graffiti's influence on graphic design, and the notion of the "tag" as an exercise in personal branding. Party beats brought to you by DJ Parler. Brother's Soul Bean Pies brings their tasty creations to Lower Manhattan for replenishment after a nonstop day of action at LMHQ. Delicious, summery cocktails provided by Art In The Age Craft Spirits + Swill. Beer on tap by Lost Tribes. It's Friday morning, so naturally we want to take our time getting to the office! Grab breakfast with us, meet some new folks working in creative tech, check out LMHQ, Lower Manhattan's newest addition to the neighborhood, meet our awesome neighbor, Dev Bootcamp, and get a jump start on your Friday! Get your buzz on with coffee from Blue Spoon Coffee Company and chia bars by Health Warrior. Free lunch and lessons learned from thought leaders in Lower Manhattan. Tarek Pertew, Co-Founder and CCO at Uncubed, hosts today's lunch and discussion with Ali Nicolas, Co-Founder and Director of Inside Startups. Together they'll explore employer branding strategies to attract and retain employees. Smorgasburg's Red Hook Lobster Pound will be providing a lobster roll lunch, straight outta Maine.